MK Dons dressing room is as united as ever as they head into three of the biggest weeks in the club's history, according to defender George Williams. 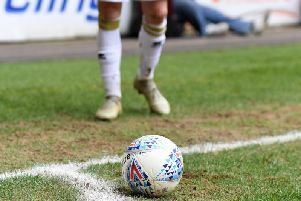 With five games remaining, Dons are three points from safety and head into Saturday's game with Doncaster Rovers knowing they must pick up points if they are to avoid relegation to League 2 next season. Despite the turmoil the table suggests, Williams insists the dressing room firmly believes they are good enough to beat the drop, and that other clubs will likely be more nervous about relegation than they are. "There's a real unity, togetherness and belief there, which is really important," he said. "I can imagine there are a lot of dressing rooms less positive than ours. "We're really looking forward to the task ahead. We know it's important to get as many points as we can. Hopefully that puts us in a good position come the end of the season." READ MORE: MK Dons press conference: What was said? Oldham's 1-1 draw with Walsall on Wednesday night extended the gap between Dons and safety to three points, but Williams insists Dons can't be looking at the performances of others instead of their own just yet. He said: "I have a brief look at the table, checking my phone to see what's going our way and what isn't, but it's important to concentrate on ourselves, because if we look elsewhere and don't perform ourselves, there's no point. We know we need to perform, so if results don't go our way, at least we've done all we can. "Each game will be as tough as the next, it's hard to say one game will be more difficult than another at this stage. All we're focused on is Doncaster, but we're really looking forward to it." Dons head into the game off the back of two defeats to the division's top two, Blackburn and Wigan, but had picked up 10 points from a possible 12 prior to that. Williams believes the team need to learn lessons from the last two games but know they'll need to return to their March form if they are to survive the relegation scrap. He continued: "We were on a great run, and we felt like we should have got a point from the Blackburn game too. Wigan was disappointing so we'll look to getting back to how we were playing. "We know three points are crucial in all our games coming up, so we need to maximise as many points as we can and see where we end up. Hopefully, we can pick back up on Saturday. "We were disappointed at Wigan, so we're hoping we can put that right. We analysed what went wrong in the performance, but it's important to move on quickly. Now it's under the carpet, and we're moving on to the Doncaster game and what we're going to do to get three points. "It's a home game, and we need to make Stadium MK in to a fortress."